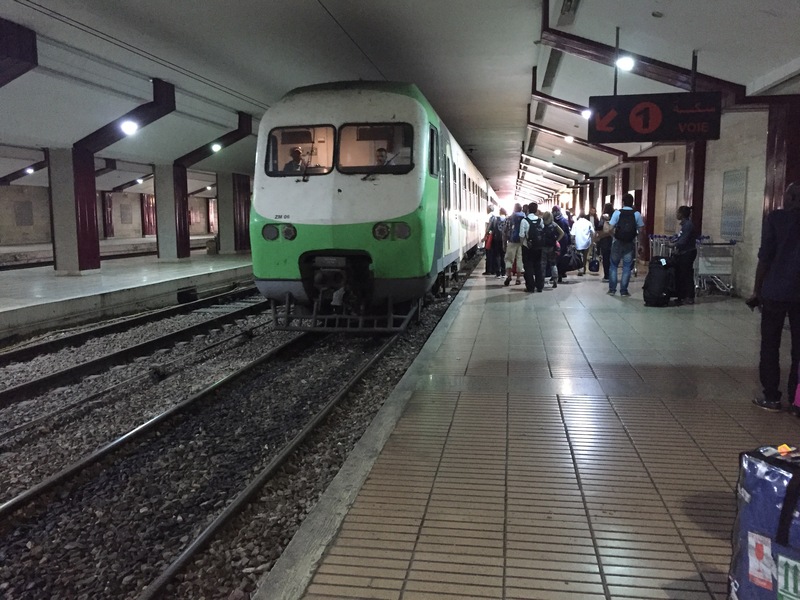 It was still mid-morning when my friends and I reached Casablanca. We heard many stories about it before going on this trip. And we were a wee bit curious about what’s in store for us. The thing is, most of the stories are a bit on the negative side. Although, many also rave how they fell in love with Morocco. The first impression that I got was the Mohammed V aéroport, a quite and neat place with several ad boards when walking through the terminal. Thankfully, the immigration check is not far away. And by luck there were merely a line in sight. It was a breeze going pass the immigration, as long as you have filled the immigration form. It was like a blessing because a few friends said that it took them around an hour to pass. It was definitely a good start since we took an 18 hour flight from Jakarta (with transits in Singapore & Paris). After we got our passports stamped, we head directly to the luggage belt. As luggages need to be collected and also it was time to reunite with a friend whom have taken a different airline to flew in. Now, back to the train. 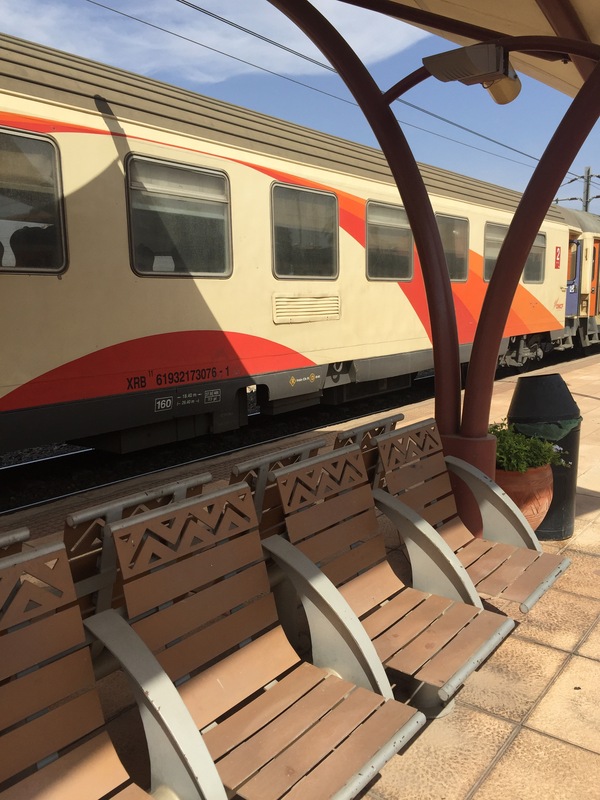 It is operated by ONCF Morocco Rail System. The train itself is not huge, and for second class passengers (like me), you will be seated inside a cabin sharable with others. Since the cabin is a bit tight, it can only fit up to 6 adults. Also, if you bring a luggage instead of a bag, prepare for some heavy lifting because you will need to put it on the overhead shelves. Many would travel with family and can be a bit reluctant to share with other travelers. Just make a run for it when the train reach the station, and you will be fine. As for us, the story goes a bit different. We found a cabin but with already a man seated before us. But, the train was about to depart and we were running out of option. So, we just head in and grab our seats. At first he seemed uncomfortable but he ended up helping us a lot. He helped with putting some of our luggage on the shelves. One of the downside when using the train was there were no announcement we have reached where. Thankfully, the guy was heading to Marrakech as well and told us where is where. The ride was around 3-4 hours in total. We passed cities, townships and deserts. Many decorated with palm tress, fig tress, and even olive tree. After some time, we were about to arrived in Marrakech. From afar, I can already see the new town part of it. Many signboards and some signage saying Bienvenue à Marrakech. The station is not huge but very clean and tidy. If you are staying in a hotel or riad, it would be best to get picked up. That was what we do and normally costs around 15€ per trip for up to 6 persons. Those petit taxis are available in the front, but you will need to haggle. 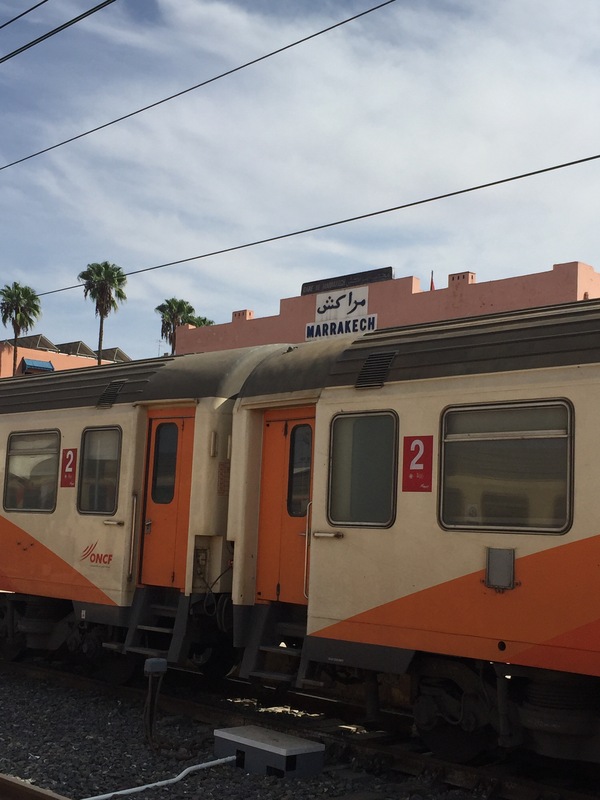 And it was time to head to our lovely riad….catch the story next. 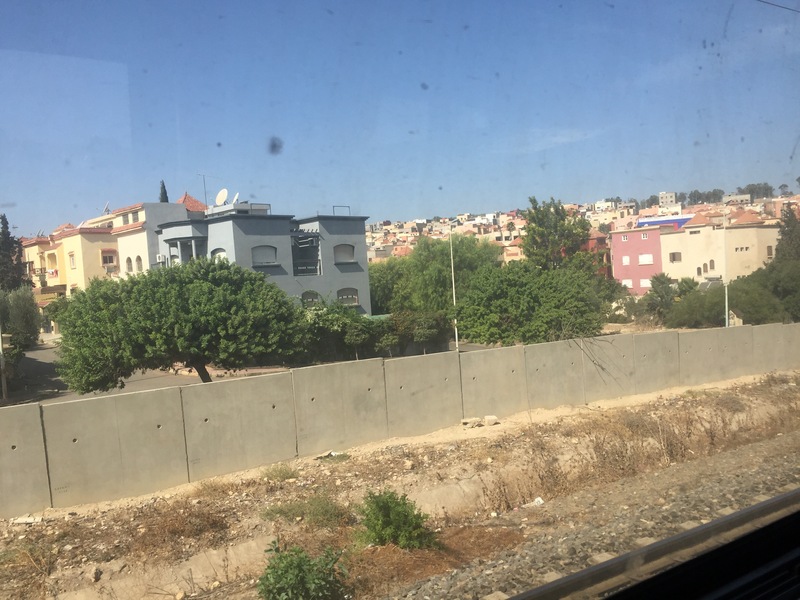 …..if you’re traveling to Morocco, check out their visa policy. Many countries are allowed to enter and stay for a short stay without visa. …..there are many points of entry to Morocco. Many would fly in to Rabat, Casablanca & Marrakech. But many also cross the border by ferry from Spain to Tangier. ……if you just got in and haven’t change your money to dirham, they will also accept euros. But as expected, the currency rate is lower than in the exchange office. Also, many don’t accept credit cards. …..most moroccans speak more than 4 languages. They’re national languages are Arabic and French. But many can also speak Spanish, German, Portuguese, and English.